Modi and Sharif have an opportunity to improve India-Pakistan relations, starting with pharmaceuticals trade. Spring is a time of hope and expectation. And in this spring of India and Pakistan’s hopeful new relations, many people are holding their breath that these two regional powers will collaborate in critical areas of interest overlap, such as substantially increasing formal, bilateral trade. One particularly high yield area – trade in pharmaceuticals and healthcare products, if structured correctly – could immediately improve the lives of more than 28 million of Pakistan’s most vulnerable citizens, and could further improve relations. By taking concrete steps here, Modi and Sharif could effectively become, “healers-in-chief,” to millions of patients, while at the same time making heroic strides toward improving both countries’ economies and security. For example, if Pakistan redirected to India (approximately 2 percent of pharmaceutical imports) from Europe even half of its drug imports, this alone would save hundreds of millions of dollars and substantially increase medicine access to Pakistani citizens. Throughout his campaign, Narendra Modi stressed the importance of increasing regional trade; the need for states bordering other countries to play larger roles in foreign policy; and a central goal of steering India on a course of “economic diplomacy.” With India’s comparative advantage in pharmaceutical manufacturing, increasing drug exports to Pakistan – a neighbor with similar disease demographics but far less manufacturing capacity – will help India achieve its goals and aid Pakistan in attaining many of its own. For example, Gujarat, the state where Narendra Modi served as chief minister, is geographically and technologically well positioned to play a role in Modi’s vision for a more state-focused foreign policy and economic diplomacy. It is not only a manufacturing and export hub for India, the “pharmacy of the developing world,” but it also borders Pakistan’s Sindh province, where infectious disease was rampant but medications scarce amongst the hundreds of thousands displaced by the 2010 floods. With proper infrastructure investments and increasing capacity in customs-related processing, this state and others could easily become medicine export outlets to Pakistan. On Pakistan’s side of the border, there is a growing unmet medical need for drugs and other healthcare-related goods for infectious and chronic diseases. Polio, which can be controlled through vaccination, has become so endemic in some areas that the World Health Organization recently imposed travel restrictions. 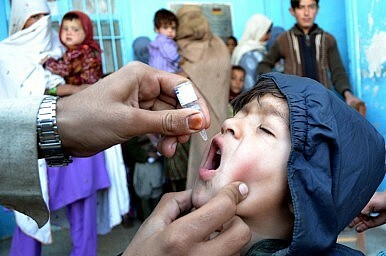 In addition to the Taliban targeting polio workers and disrupting vaccination campaigns, patients with multiple untreated medical conditions such as vitamin deficiencies and anemia can lower overall vaccination effectiveness. And with Pakistan’s growing population, the needs for low cost pharmaceutical products will only increase. Neither country should view increased pharmaceutical-related trade to Pakistan as merely an altruistic gesture. Both countries would benefit from increased medicines on one side, and increased business on the other. For example, the Bharatiya Janata Party’s (BJP) goal of improving on the Indian economy’s current 5 percent annual GDP growth will require manufacturers to supply markets beyond India. And while India’s trade with its many small neighboring countries will help, increasing trade with Pakistan, with which India shares its longest border (3000 km), and which has the largest comparative GDP (e.g., 13 percent vs. next largest, Sri Lanka, at 3 percent) will help accomplish this goal much faster. Yet violent storms can unexpectedly appear, even in the most peaceful of springs. Thus, Modi and Sharif’s hopeful first steps could be dashed by the turbulence of a new terrorist attack traced to Pakistani soil or Modi losing the political space to stand up to the overly nationalist elements of his party. Pakistan and India are all too familiar with progress being extinguished by unexpected events. To effectively guard against such bad weather, India and Pakistan should quickly, while there is post-election momentum, establish strong constituencies with vested interests to ensure that relations continue to improve. One way to achieve this is for India and Pakistan to expand the India Pakistan Joint Commission, where technical experts, health professionals, and businessmen from both countries learn from each other and collaborate on projects of significance to both countries. Increasing trade in pharmaceuticals and other health-related products would be an opening salvo, but not a panacea for India and Pakistan’s long, tortured relationship. That said, the size of this introductory step should not prevent the two countries from taking it. The actions of India and Pakistan, like the Himalayas that crown them both, help shape South Asia’s climate. If they have not already, Narendra Modi and Nawaz Sharif will quickly come to realize that beyond this current spring, the season is mostly up to them. Kermit Jones MD, JD was a 2012-13 White House Fellow at the Dept. of Health and Human Services and a term member of the Council on Foreign Relations.